FILE - Paramilitary policemen and members of a gun salute team fire cannons during a training session for a military parade to mark the 70th anniversary of the end of the World War Two, at a military base in Beijing, China. China is now the world’s third largest arms exporter behind the U.S. and Russia, and the country accounted for nearly six percent of arms exports between 2011 and 2015. China is now the world’s third largest arms exporter behind the U.S. and Russia, and the country accounted for nearly six percent of arms exports between 2011 and 2015. 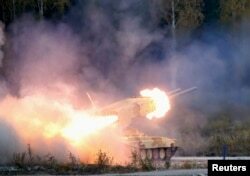 FILE - A Russian "TOS-1 Buratino" multiple rocket launcher fires during the "Russia Arms Expo 2013" 9th international exhibition of arms, military equipment and ammunition, in the Urals city of Nizhny Tagil. The U.S. and Russia’s weapons exports grew by 27 and 28 percent respectively during the period. The U.S. and Russia’s weapons exports grew by 27 and 28 percent respectively during the same period, although both countries are still far ahead of China and the rest of the world in total sales. Imports of arms to China fell 25 percent compared with the previous five-year period, indicating that China now has the technological capability and know how to produce many of its own weapons. Wezeman said territorial disputes and the growing modernization of China’s military may be spurring an arms race in Asia. China’s military budget was up 10 percent from the year before, to more than $141 billion. “You can see a general arms build-up in Asia. You can see countries reacting to what neighbors are doing, and a strong driver for this is Chinese military modernization, expanding Chinese capabilities, linked to a quite assertive Chinese policy,” he said. Vietnam jumped from 43rd place to become the eighth-largest arms importer from 2011 to 2015. The country now accounts for roughly 3 percent of world-wide arms purchases during that period. India imported 14 percent of globally traded arms during that time period. Gregory Poling is the director of the Asia Maritime Transparency Initiative and a fellow with the Sumitro Chair for Southeast Asia Studies at CSIS. 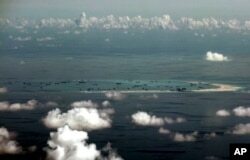 Poling said China's recent actions in the South China Sea are raising tensions throughout Southeast Asia. Five billion dollars in global trade passes through the waterway every year, and the sea is thought to be rich in oil and gas reserves. Bonnie Glaser, a senior adviser for Asia and the director of the China Power Project at CSIS, said while territorial disputes may boost arms sales in Asia, China's neighbors' won't be able to keep up with the pace of China's military modernization. Collaboration among China’s neighbors has already increased to protect their territorial claims. Earlier this month Vietnam announced it will allow India to set up a satellite tracking center in southern Vietnam that will provide it with access to overhead images of the South China Sea.